Barbara Bush, from left, George Bush, Joe Machol, and Mike Machol. 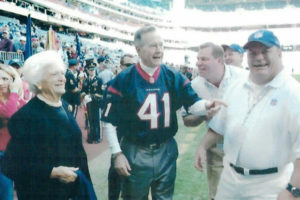 I met George and Barbara Bush for the first time at Reliant Stadium in the fall of 2002. It was at the first ever Texans game that I was officiating. I was on the sidelines in front of the Texans bench a hour before kickoff when President and First Lady Barbara Bush walked up and said hello. I said hello Mr. President and we shook hands. Barbara said hello and I shook her hand. I was able to ask President Bush if the story was true, about he and National Security Advisor Brent Scowcroft, fishing while discussing Operation Desert Storm, He said, young man how did you know about that? I said I read an article; he said yes we did. I felt a tap on my shoulder. Barbara asked me if I would give her the sport coat George had on. I thought for a moment, how do I do this task? I said Mr. President the First Lady would like your sport coat. George said yes sir young man, here you go, and he took off his coat and handed it to me. The crowd started cheering when they saw the Houston Texans jersey he was wearing, with number 41 and BUSH on the back. I handed the sport coat to Barbara and she said thank you young man, I have been trying to get him out of that coat for 20 minutes. I laughed and watched them walk around the field. I met them both many times at Texans games over the years, and yes, they were always friendly and said hello every time. I spent a moment in time with the former President and First Lady, yet they made me feel like I was the only one in Reliant Stadium. The memory is still vivid in my mind. People are judged by the way they treat others. It speaks well of Barbara Bush, on how well she treated, all humanity.